Earnings HQ: FBN’s Ashley Webster breaks down Home Depot’s third-quarter earnings report. Home Depot’s (NYSE:HD) third-quarter earnings jumped 14% as customers appeared to shrug off a large-scale credit card breach and boost spending on do-it-yourself projects. The world’s top home improvement retailer booked a profit of $1.54 billion, or $1.15 a share, compared to $1.35 billion, or 95 cents a share, in the same period last year. Sales grew 5.4% to $20.52 billion. 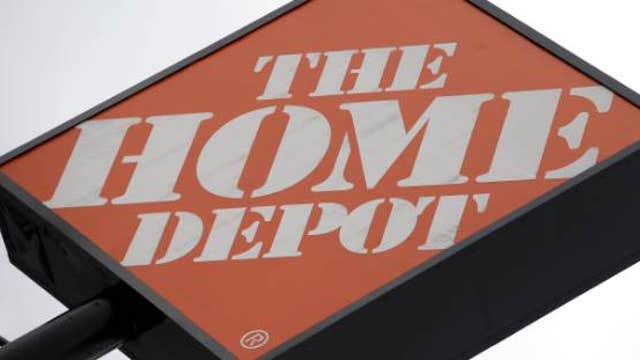 Earnings included the sale of a portion of Home Depot’s ownership in HD Supply Holdings (NASDAQ:HDS), resulting in a pretax gain of $100 million. Wall Street was looking for lower earnings of $1.13 a share and revenue of $20.47 billion. But shares fell 79 cents, or 0.8%, to $97.24 in recent trading Tuesday. Chief Executive Craig Menear, who succeeded Frank Blake at the start of November, said Home Depot continues to see a recovering home improvement market in the U.S., he told analysts during a conference call. He noted sales to both consumers and construction professionals have grown. For U.S. stores, comparable sales were up 5.8% in the quarter ended Nov. 2. Overall same-store sales increased 5.2%. Total customer transactions climbed 3.2%, and the average ticket edged 2.3% higher. In September, Home Depot notified customers it had begun investigating a possible breach of its payment systems. The Atlanta-based company ultimately discovered hackers accessed part of Home Depot’s network using a third-party vendor’s credentials. Up to 56 million credit and debit cards, as well as email addresses, were compromised by the breach, topping the massive cyber-attack at Target (NYSE:TGT) during Black Friday last year. Earlier this month, Home Depot said another 53 million emails may have been stolen. Home Depot assured customers PIN numbers remained safe and any fraudulent charges would be covered. The retailer also offered credit monitoring and identity protections services free of charge. On Tuesday’s conference call, Menear said Home Depot will continue to implement enhanced security measures. Home Depot logged pretax expenses of $28 million tied to the data breach in the third quarter. The net cost for the full year is forecast to hit $34 million, which is included in the company’s guidance. However, its 2014 outlook doesn’t include probable expenses such as reimbursements for fraudulent purchases. The company said it can’t estimate those costs yet. The company affirmed its forecast for full-year sales growth of 4.8% and earnings per share of approximately $4.54. The company plans to repurchase $1.26 billion of its shares in the fourth quarter. Through the latest period, Home Depot has bought back $5.74 billion worth of stock this year. Rival home improvement chain Lowe’s (NYSE:LOW) is scheduled to report quarterly earnings Wednesday.